We were all disappointed to see a new Command & Conquer mobile game announced at E3, complete with microtransactions and an odd rendition of Kane. However, having spent some time with the game in alpha, it's a pretty good touchscreen RTS, albeit one sorely lacking any of C&C's quirkiness. Can you really put Red Alert style live action to-camera monologues in a modern App Store game? Probably not, but I'd like to see someone try. You and your opponent each have a base. Between the bases are three capture zones positioned around a nuke launcher. You must hold the majority of the capture zones to slowly power up the nuke, to the point that it sails offscreen and then plunges into the enemy base. Each base can take two nukes (they are gentle nukes) before the game ends. You accrue minerals in regular bursts, and you can speed up your intake by buying a harvester. You spend minerals by tapping on a unit card to summon them to the battlefield, then you can tap on a hex to move units around and attack enemies. Once you've deployed a unit you have to wait a few seconds to deploy another. With a harvester sucking up surplus minerals this cooldown period is actually your big tactical limit—I sometimes find the wait agonising as I'm waiting to play a counter to something my human opponent is fielding. There are a few other features, like a special ability that lets you throw down a turret (this is particularly good for blocking units, and they mince up infantry), but I mainly enjoy the game because each base has multiple points of weakness. 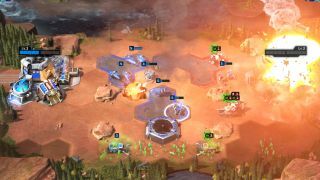 Instead of capturing the nuke you can neutralise the nuke capture points using cheap fodder units and instead send base-busting warriors directly to the enemy's building. Or you can go after your opponent's harvester to deny them access to late-game units and then mass produce your own. Units slot into rock-paper-scissor arrangements—the RTS cycle of death—this time presented as infantry vs. vehicles vs. planes. The strongest units (often massive death bots) are strong against multiple unit types. Inevitably, you receive these as rare drops from the game's loot boxes, which I have so far received regularly every three or four games. Games are really short, too. I can finish my nuclear war before the kettle has boiled. Remarkably there is an element of micro too, as much as my stupid thumbs can manage. Terrain and the cramped area around the nuke itself means that positioning is important and there are chokepoints to clog up with cheap 10-mineral infantrymen. I wish there was a way to manipulate my units' pathing once I've set a destination though, because that would stop my base-killing rocketeers from ambling right through the middle of a crowded battlefield. I'm quite sold on the game itself, but I have reservations about how the microtransactions will affect balance in the long term. Microtransaction-driven mobile games love to give you a honeymoon period full of free loot and card drops, before slowly putting on the screws. I don't mind paying a reasonable amount for entertainment I've thus-far enjoyed for free, but I'm more concerned about the fact that the drops feed a power economy. You spend in-game currency and duplicate unit cards to power up your units, giving them more power and health in battle. So far matchmaking has matched up my power with my opponent's quite well. At Gamescom an EA representative suggested that if you hit a power mismatch you can earn underdog bonuses. The game is still in closed testing, so it's too early to see how the system will work just yet. If you're looking for a quick burst of strategy to play on the toilet, this might not be a bad choice. Don't go in expecting any warm, fuzzy C&C nostalgia, though: the licence is very much a skin draped over a seemingly competent quickfire RTS.